It has been a busy season for special teams. Fake punts, exciting returns, and now a Saints blocked punt. 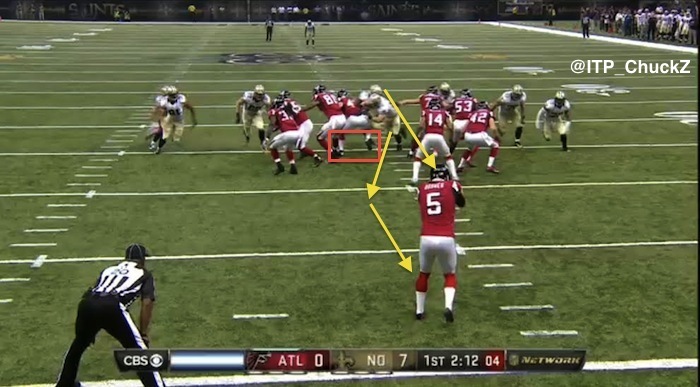 Chuck Zodda looks at how the New Orleans Saints put an early touchdown on the board in a play reminiscent of Steve Gleason’s magical block in 2006. 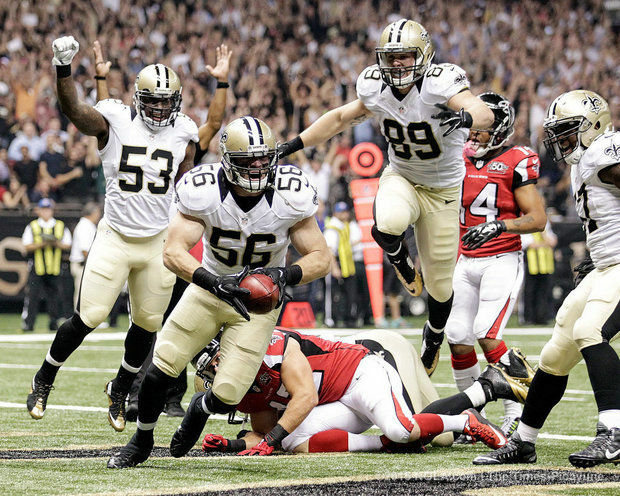 The New Orleans Saints have had little to cheer about this season. Coming into their game with the Atlanta Falcons at 1-4, it has been a rebuilding year for the Saints, and one that has seen significant injuries in the secondary, as well as to quarterback Drew Brees. But with 2:13 remaining in the first quarter on Thursday night, the Saints turned the clock back to 2006 in a play that was eerily similar to Steve Gleason’s block just over nine years earlier. 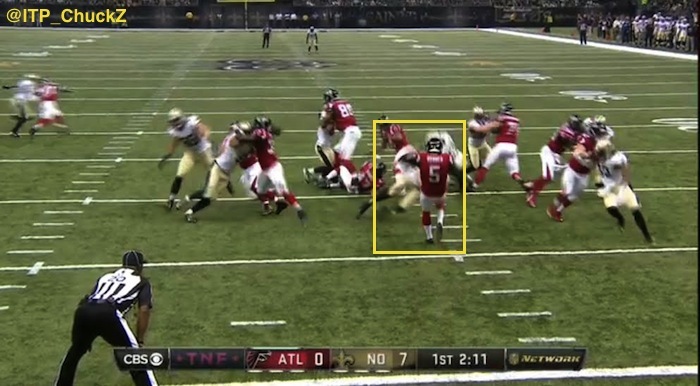 Bosher has his heels at the 2-yard line, with the ball on the right hash. 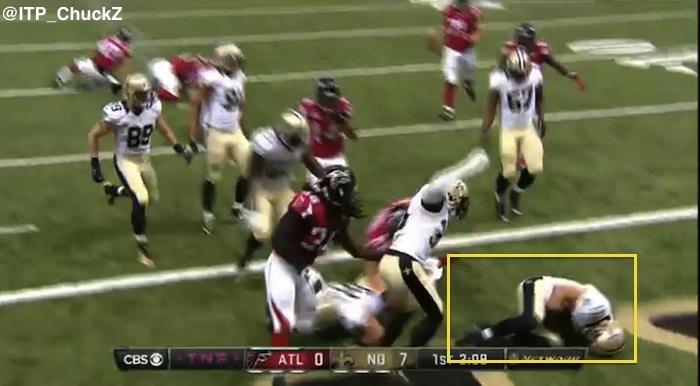 The Saints show eight men along the line of scrimmage, suggesting a block attempt, rather than playing for a return. The key to this block happens in the middle, where the two interior rushers will twist into the A gaps. Michael Mauti will fire first, coming from the right side of the frame, with the second rusher coming around his back and towards the right hash. 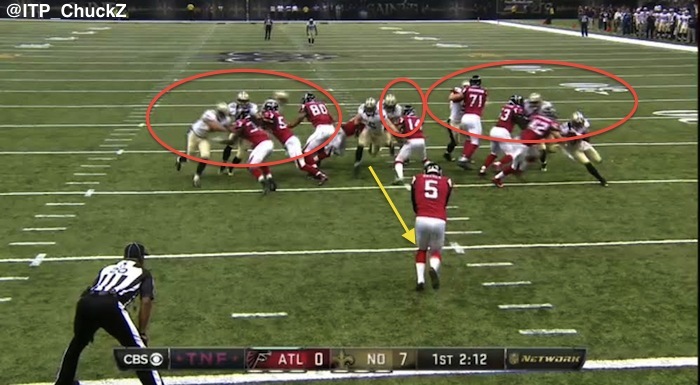 With eight Saints along the line of scrimmage, Atlanta will need every one of their blockers to pick up a man in their zone-blocking scheme. 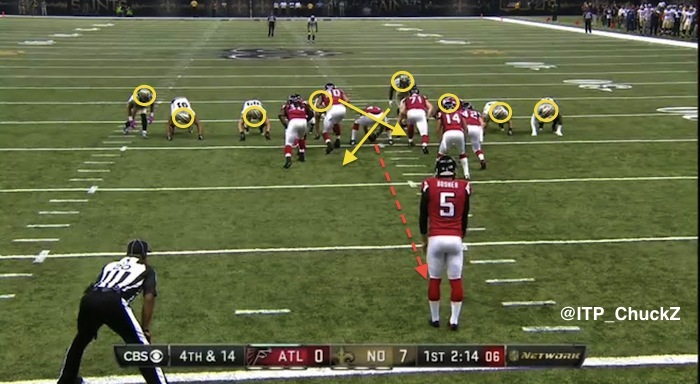 The Falcons have Eric Weems (#14), the personal protector, aligned on the right side of their protection, with long snapper Josh Harris (#47) sent to the left A-gap. Weems is responsible for the right A-gap. However, Mauti crashes down from the right, pinning Harris momentarily as he blows past him. Behind him, the second man in the twist flows into the right A-gap where Weems is waiting. While Harris was technically assigned to the left A-gap, he now has no one to block with his man vacating the area. He is blocking empty space. It is a brilliant design by the Saints, who exploited Harris’s responsibilities to create a hole up the middle. All video and images courtesy of CBS and the NFL Network.